To a food processor (or blender), add oats and process until smooth, about 1 minute. Add in baking powder, baking soda, kosher salt and cocoa powder. Process until uniform consistency achieved, usually about 30 seconds. In a medium bowl, add pureed avocado, an egg, almond extract, almond milk, and maple syrup. Mix together with a spatula. Slowly add 1/4 cup of the oat flour mixture into the wet avocado mash. Mix together and continuing adding until all ingredients are combined. Pour batter and distribute evenly into four 3-inch round or rectangle cake pans sprayed with non-stick spray. Bake in the oven for 28 minutes, or until a wooden stick when inserted comes out clean. Let cool for 5 minutes on a wired rack. 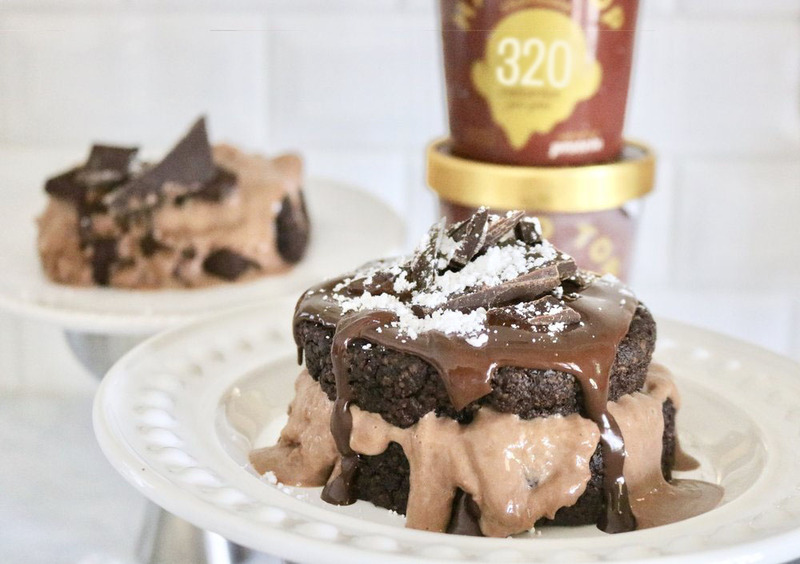 Take the Chocolate Halo Top out of the freezer to soften while cake is cooling. Garnish with chopped chocolate and enjoy! Note: You can use a muffin tin sprayed with non-stick spray too. Batter should make about 9-10 muffins.